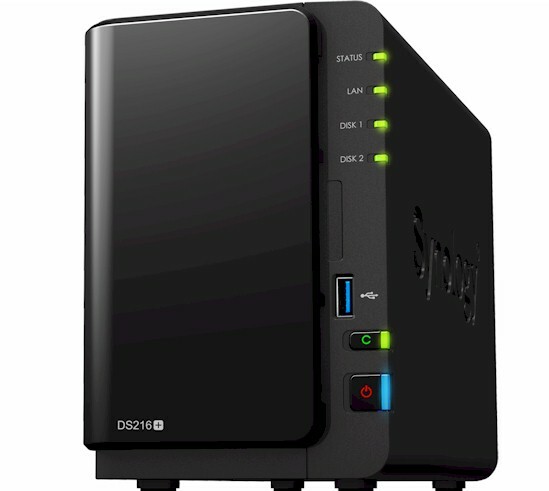 The DS216+ is the cheapest member of Synology's "Plus Series" aimed at "Workgroup/ Small & Medium Business" buyers. Like the expandable DS716+ I reviewed in January, the 216+ uses an Intel Celeron processor. The DS215+ it replaces used a dual-core Annapurna Labs Alpine AL-212. While the DS216+ has a significantly lower price than the DS716+ (currently ~ $340 vs. $450), it shares most of the features of its more expensive sibling. It's also a better performer, as we'll see in a bit. Synology's website has one of the best product comparison tools I've seen. The image below shows just a portion of all of the features in a comparison between the DS216+, DS716+ and the Value Series DS216. The DS216+ has its own Quick Installation Guide that includes step-by-step instructions for mounting drives into its tool-less disk trays, connecting the DS216+ to power and LAN and configuring the NAS. The Quick Installation Guide also includes front and rear panel callouts, shown below, as well as an LED Indicator Table found in Appendix B. Unlike the DS716+, which features locking disk trays, the DS216+ just has a press-fit drive bay cover. The DS216+ uses the same case as the DS216 with a few subtle of differences. The DS216 has two USB 3.0 ports on the rear panel and one USB 2.0 port on the front. Conversely, the DS216+ has two USB 2.0 ports on the rear panel and only a single USB 3.0 port on the front panel. The DS216+ also has an eSATA port that's missing on the DS216. The DS216+ uses the same case as the DS216, so we could not open it without risking case damage. Therefore, most of the DS216+ components listed in Table 1 are guesses and assume a design similar to the DS716+. For this review, we decided to compare the DS216+ with the top-ranked ASUSTOR AS5102T and the Synology DS716+. All three NASes target the Small/Medium business user. Of the three products, the DS216+ is at a hardware disadvantage compared to the other two. DS216+ has only a dual-core Intel Celeron and 1 GB of RAM; the other two NASes have quad-core Celeron processors and 2 GB of RAM. The DS216+ drew 19 W with two Seagate NAS HDD 4 TB ST4000VN000 drives Synology included spun up and 8 W with the drives spun down for power save. RAID 1 rebuild was immediate when the bad block check was skipped. Noise was rated as low.